Your art teacher tells you to 'fill the page'. How? With what? 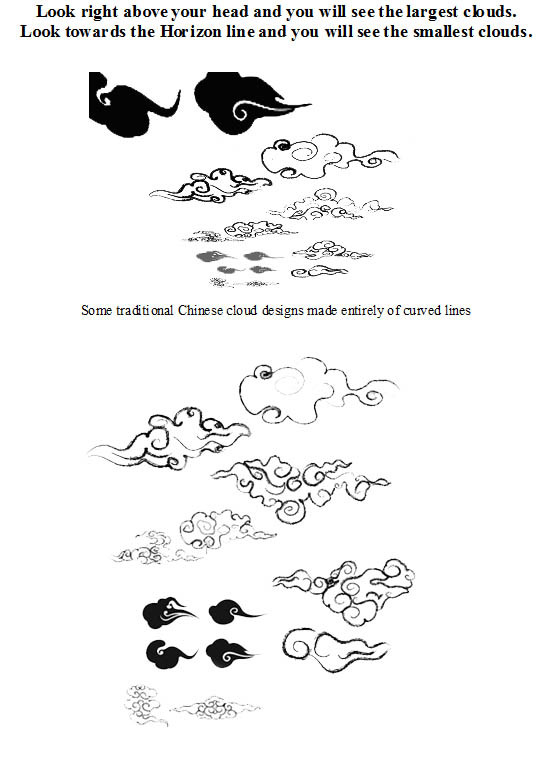 Here is a trick that many artists, throughout history and around the world, have used. I hope you find it helpful. The dominant form is the mass of buildings on the left. St. Peter’s Basilica, the domed building, just to the left of the center of the picture, is the subordinate form and the focal point of the picture. Put the dominant form off to one side, never in the middle. 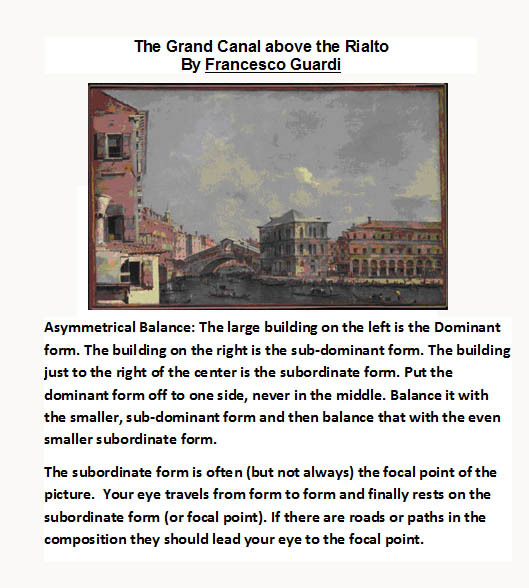 Balance it with the smaller, sub-dominant form and then balance that with even smaller subordinate form. The subordinate form is often (but not always) the focal point of the picture. Your eye travels from form to form and finally rests on the subordinate form (or focal point). If there are roads or paths in the composition they should lead your eye to the focal point. Here is a study of St. Peter’s from Corot’s sketchbook. 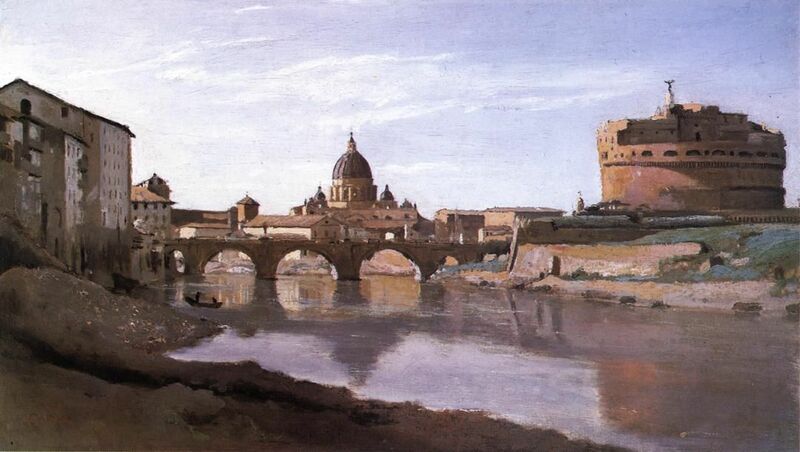 Corot made many such quick compositional studies when he visited Rome. He made the final painting at a later date when he got back home to his studio in France. Before the invention of the camera artists like Corot relied entirely on sketches and memory to create their finished paintings. 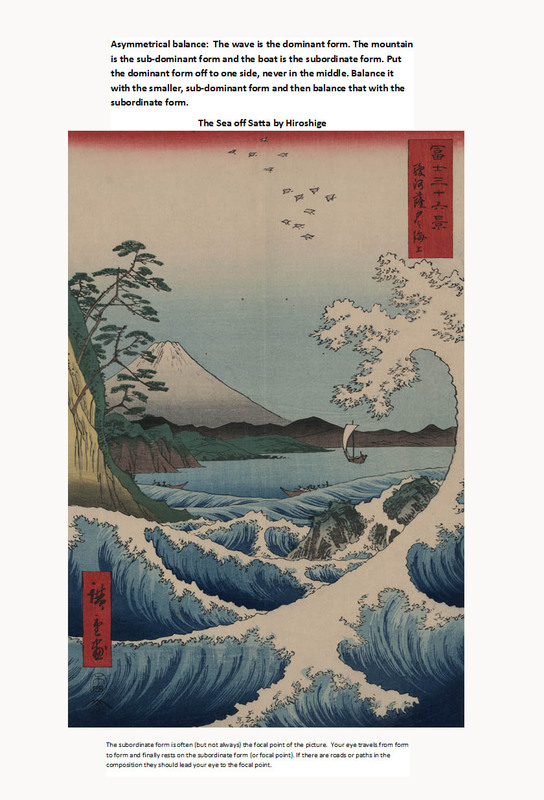 Here are some printable handouts of artwork by famous artists. 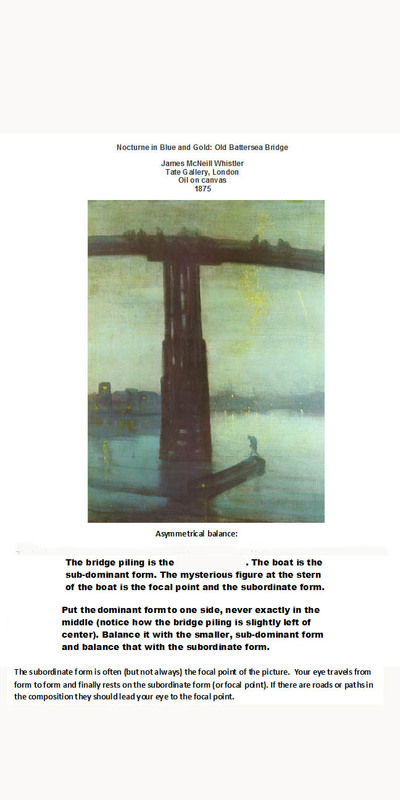 Each one of these pictures follows the same formula for asymmetrical balance. artists make quick compositional sketches. A compositional sketch should not be detailed. to make sure they balance eachother harmoniously. 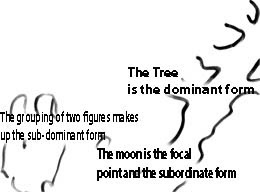 To illustrate this point, I have created a quick compositional sketch of 'Man and Woman Contemplating the moon'. 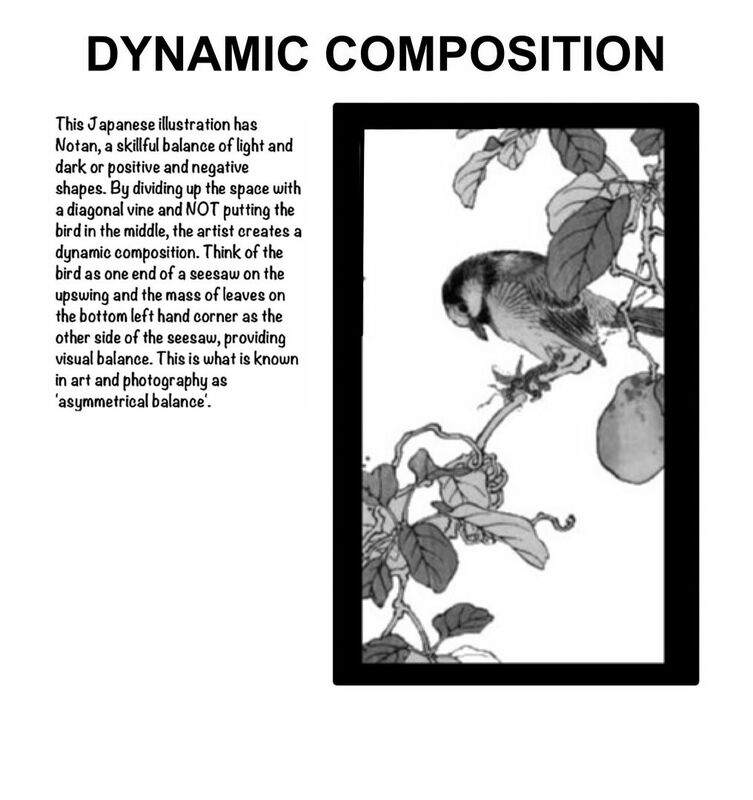 Look at the pictures below and create quick compositional sketches for each one. Before you read my analysis of the composition, find and label the dominant, sub-dominant and subordinate forms. Try finding other pictures that use asymmetrical balance to create harmonious compositions. John Singer Sargent (American, 1856-1925). The Woman in the white dress is the dominant form. When you first look at the picture,your eye automatically goes to her first. But it does not stay there. 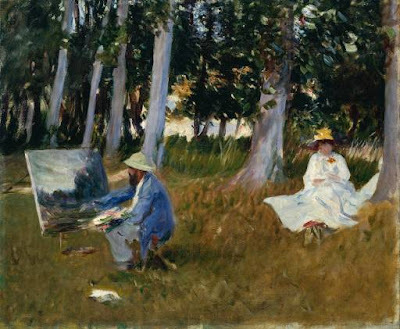 The large canvas that Monet is painting on the left side of the picture balances her. It is slightly smaller than the woman and not as brightly colored. The canvas is the sub-dominant form. Your eye will rest on the canvas only for a moment before it travels to the figure of Monet sitting at his easel. to be your dominant form. 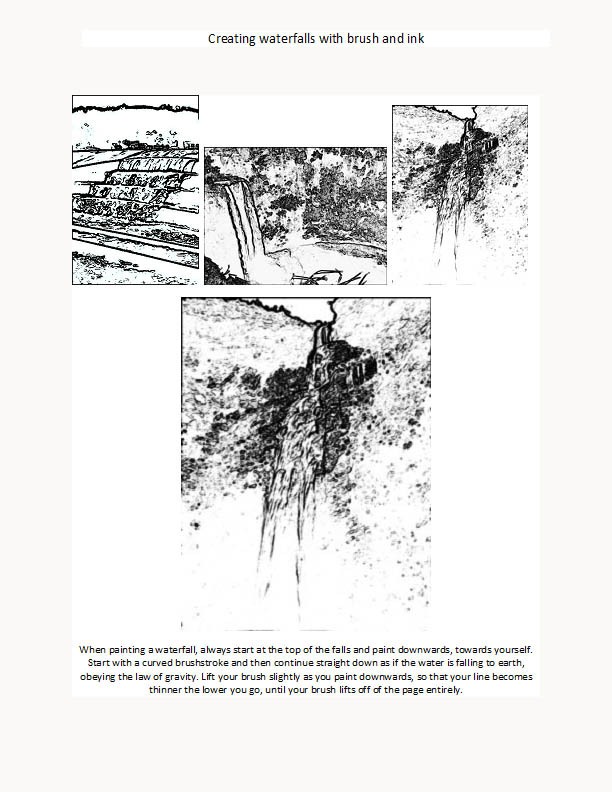 to sub-dominant form and naturally rest on the focal point of the painting. 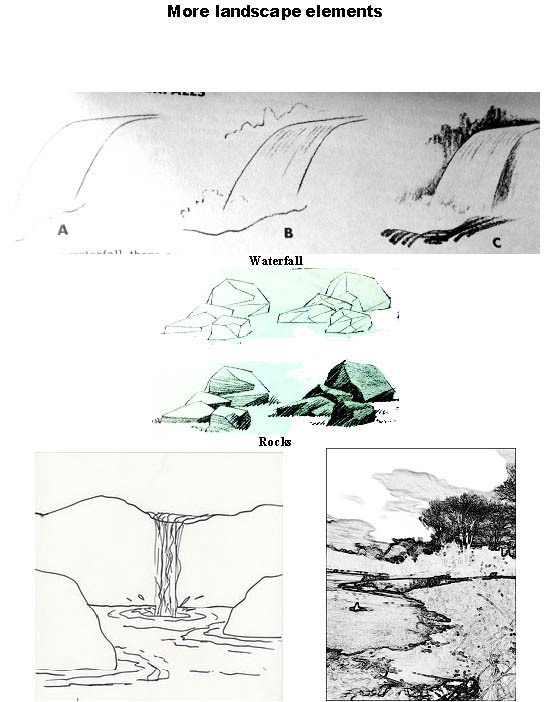 Each of these artists knew how to balance landscape elements of varying size to create dynamic compositions but not a single one of them used this trick all the time. 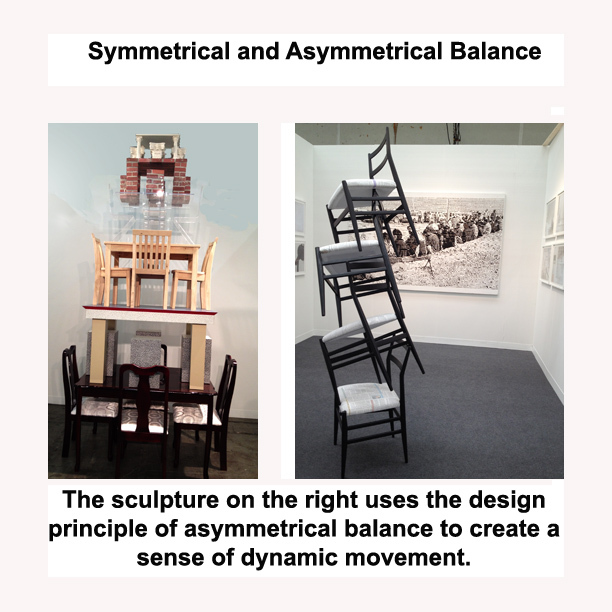 If you ever get confused about how asymmetrical balance is used in art, just envision that you are building a sculpture by stacking pieces of furniture on top of one another. The easiest, most obvious way to do it would be to put the largest pieces on the bottom and create a symmetrically balanced pyramid form. But what if you could figure out a way to balance and counter balance each piece of furniture so that your sculpture could stand up without being symmetrical? You could create something exciting with a sense of tension and dynamic movement. even though the design is not symmetrical? If the chairs did not have just the right asymmetrical balance, the entire sculpture would crash to the ground. 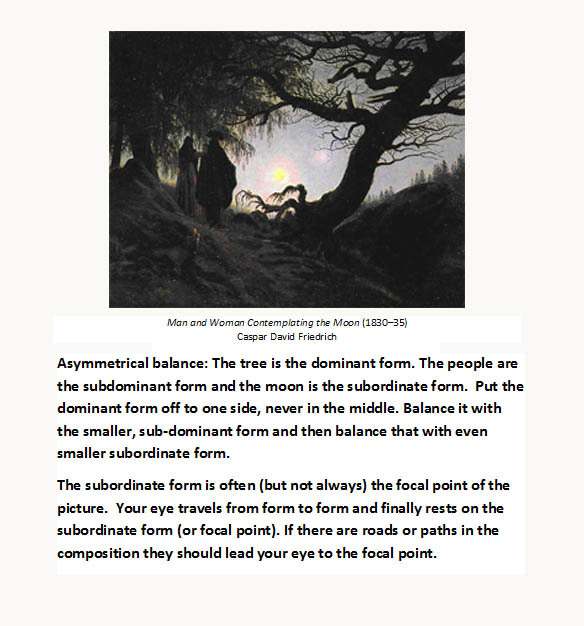 It is not so simple to determine asymmetrical balance with a picture. 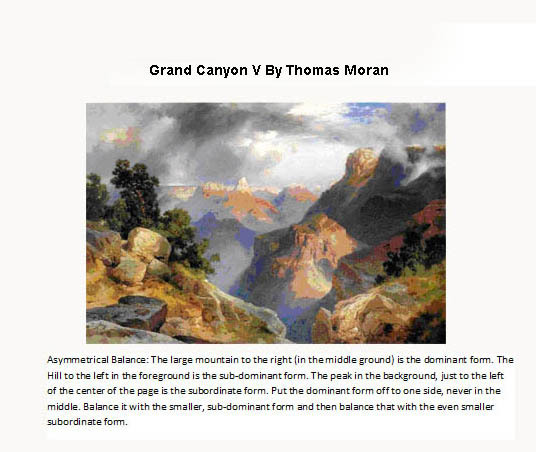 The composition should allow the viewers eye to travel comfortably around the page. 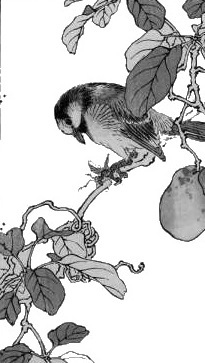 Here is a higher resolution image of the illustration. Try printing it and adding your own grid lines. 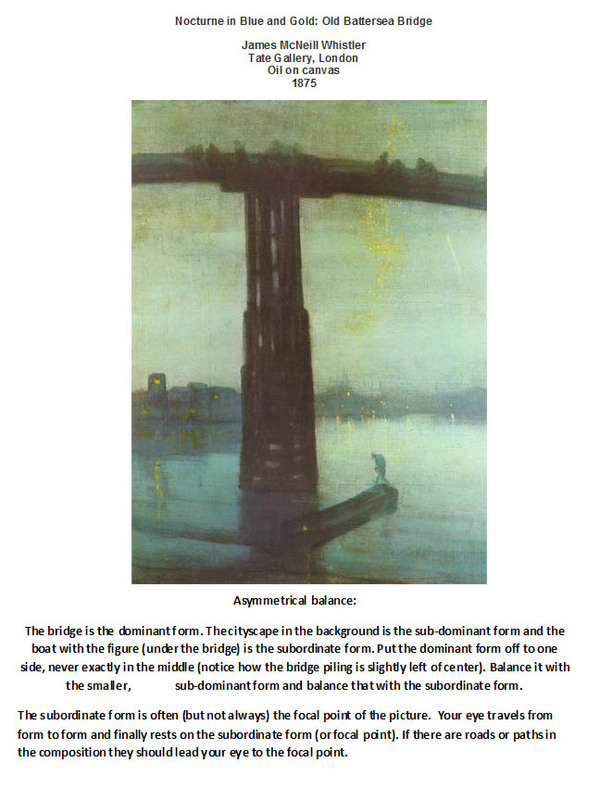 Analyze printouts of your favorite paintings to see which ones follow the 'rule of thirds' and which do not. 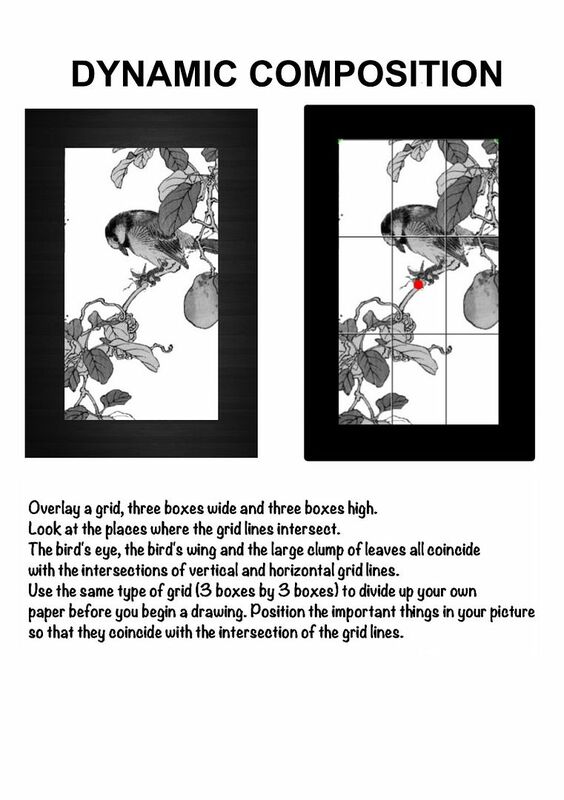 Print out low resolution black and white versions of famous pictures and draw your grid directly on the image. Make absolutely sure the image you are using has not been cropped! Lesson was simple, flexible and a surprising reminder of how to look for a composition in life without just accepting what's out there. 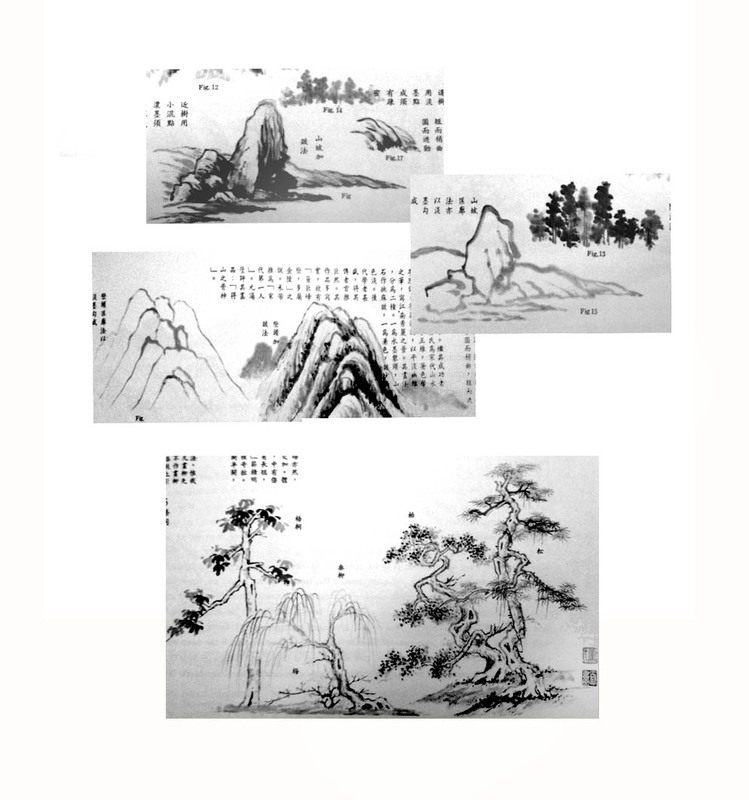 The number of examples presented and their variety are a challenge for the artist who might have thought of himself as just being like a camera and literally copy the world. Art has a personal view of life, it interprets what is out there through the mind of the artist as well as his hands and skills! This has really enhanced my thinking of the division of the frame by light years! 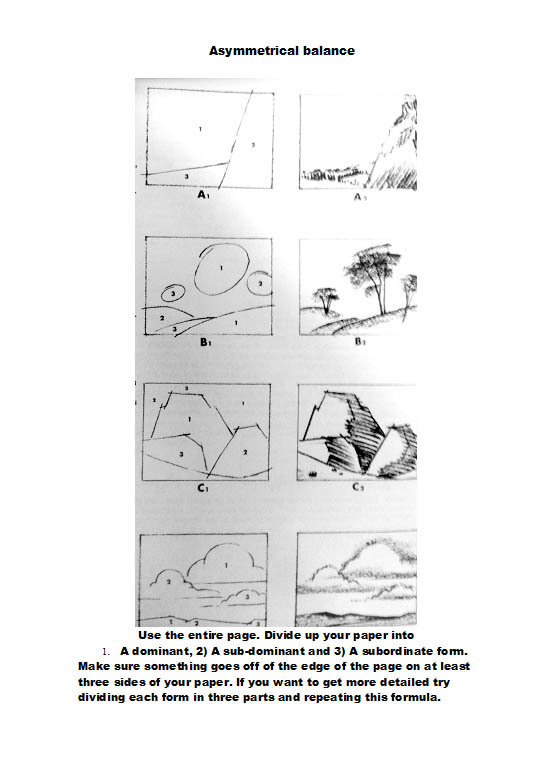 Can you eloborate on how positive and negative space can also have dominant, subdominant, and subordinate divisions -- even within the same picture plane? Also, it seems like it is OK if two dominant, subdominant, and subordinate divisions overlap -- like one in positive space and one in negative. Is this true?